The Yarmouth Clam Festival Schedule runs for three days and includes food and fun for the whole family. 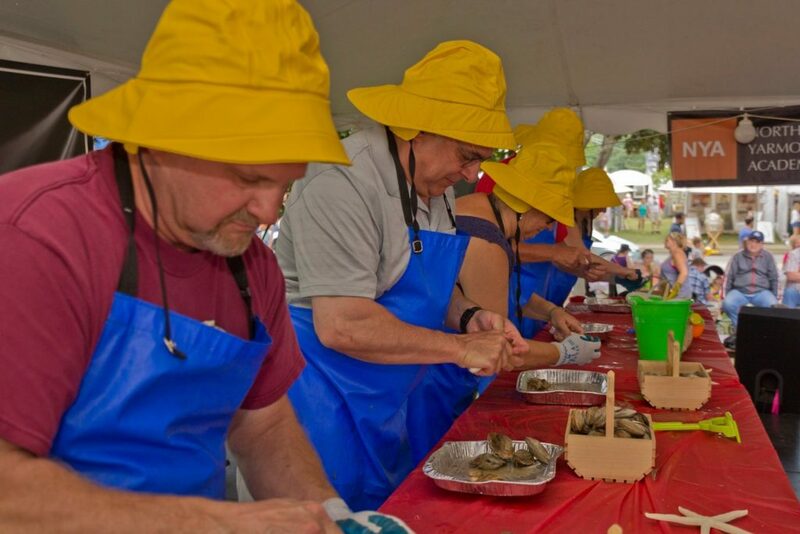 The Clam Festival always takes place the 3rd Friday in July and over 6,000 pounds of clams, 6,000 lobster rolls, 2,500 pancake breakfasts, 2,000 shore dinners, 400 homemade pies, and 6,000 strawberry shortcakes are served during that time, washed down with over 13,500 Lime Rickeys! The 2018 Yarmouth Clam Festival runs from July 20th until the 22nd and, as always, admission is free. Below are the latest details of the 2018 Yarmouth Clam Festival Schedule, including the date and time of the clam shucking competition, parade, road race and fireworks. 10:00am – Opening ceremonies take place Friday morning, with the Art Show, Craft Show and Carnival opening at this time. 12:00 – 3:00pm – Free horse and wagon rides near the craft show. 6:00 – 7:30pm – The Clam Festival Parade takes place on Main Street. There is also live music throughout the day and evening. 7:00 – 10:30am – Flapjack breakfast at First Parish Church and Memorial Green. 7:15 – 7:45am – Kids Fun Run on Main Street at Memorial Green. To participate you need to register online, by mail or in person before Monday, July 16th. For details on how to register for the Yarmouth Clam Festival Kids Fun Run click here. 8:00am – The Yarmouth Clam Festival 5 Mile Road Race starts on Main Street at Memorial Green. 10:30am – 12:00pm – Free horse and wagon rides at Village Green Park. 11:00am – The Maine State Clam Shucking Contest kicks off at Memorial Green. In addition to two celebrity heats (TV and radio personalities), there are professional and amateur heats, with prizes going to the fastest shuckers in each category. 1:00pm – Firefighter’s Muster on Main Street at Memorial Green. 4:00 – 7:00pm – More free horse and wagon rides. 9:15pm – The Yarmouth Clam Festival fireworks always take place on Saturday evening. They are best viewed from behind the Library, Smokey’s or Memorial Green. There is live music, art and other entertainment throughout the day. 9:00am – The men and women’s bike race (a 3.6 mile course) kicks off at Memorial Green. 10:30 – 12:00 noon – Free horse and wagon rides along Main Street, starting at Village Green Park. 11:00am – There will be an interfaith service at the Old Meeting House on Hillside Street. 12:00 – 1:00pm – The Diaper Derby will take place at Memorial Green. With prizes for the fastest crawler (1-12 months), toddler (13-24 months and 25-36 months). 12:00 noon – There will be a one mile kids bike ride beginning at Village Green Park in front of Village Florist. 2:00 – 5:00pm – More free horse and wagon rides. There is also live music, art and other entertainment throughout the day. To read about other Maine seafood festivals, click here.